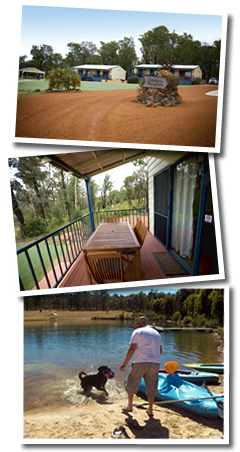 The Dwellingup Forest Lodge is the perfect holiday break to relax and unwind from the stress of life, offering chalet accommodation in beautiful, peaceful and unspoilt WA countryside just over one hour south of Perth, Western Australia. Idyllic surroundings will have you feeling closer to nature while our clean and modern facilities provide you with the creature comforts that you are so used to. Even your pets can enjoy the surrounds, as we are still proudly dog friendly. Take your best friend on a delightful walk, enjoy our scenic views, and when the day is done relax and enjoy magnificent views of lake and forest. We would love to welcome old and new friends here to enjoy our hospitality! The pristine lake, lush green lawns and sheltered BBQ area all contribute to the tranquil Dwellingup Forest Lodge experience and while we are doggy friendly we advise you to look at our guidelines for dog owners planning on bringing their pets to stay with us (See "Doggy Notes"). 55 Helio Road (off Farley Road), Dwellingup WA 6213, relax@dwell.com.au. See map for further details.